With more than 450 million members, LinkedIn® has swiftly solidified itself as a global community of professionals. Over the years, the network has evolved into a robust publishing platform for businesses to engage and target their content to a more professional audience. This network shift has positioned LinkedIn® Company Pages as an integral component of an organization’s social communication strategy. 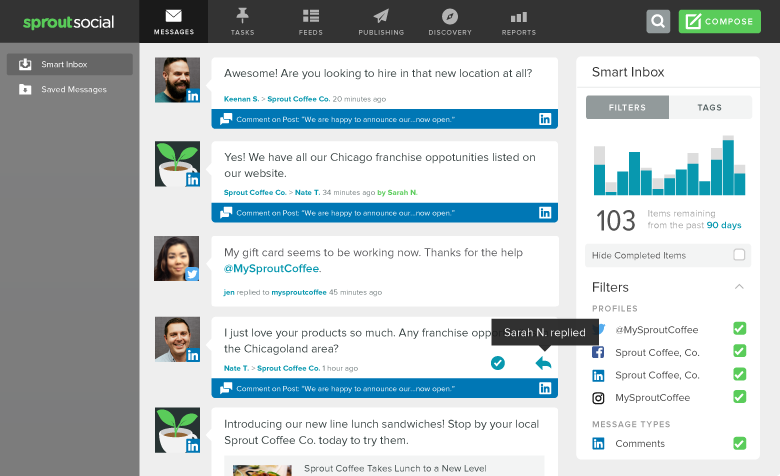 Sprout is excited to announce the next step in our LinkedIn® integration. Rounding out our existing publishing and reporting capabilities, users can now monitor and engage with comments on their LinkedIn® Company Page posts directly from the Smart Inbox. Brands are turning to LinkedIn® to distribute thought leadership content to a tailored audience of professionals. Whether you’re showcasing your company’s products or services, announcing an upcoming networking event or sharing your latest blog post, LinkedIn® is an effective channel for communication focused on your broader business. To begin managing comments on your Company Page posts, simply select the new LinkedIn® Comments filter in the Smart Inbox. 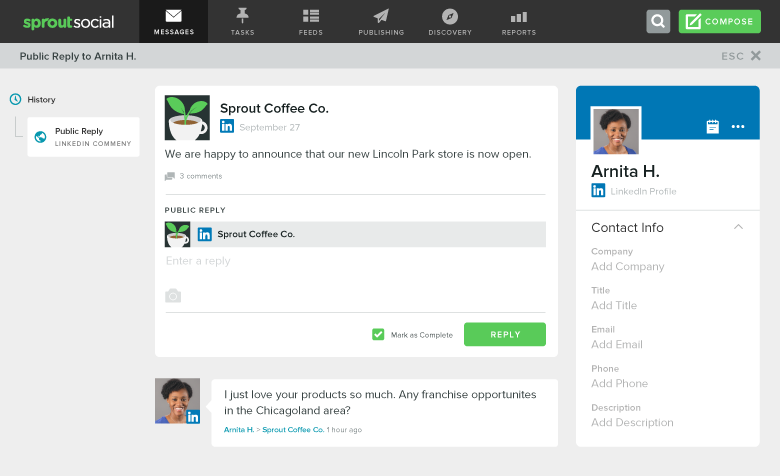 You can reply to comments and take advantage of Sprout’s collaboration and engagement tools by tasking, tagging and marking inbound LinkedIn® messages as complete. When replying to comments, the new LinkedIn® Contact View provides the context necessary to better understand who is engaging with your brand. Viewing past comment history between a LinkedIn user and your Company Page leads to more informed conversations and stronger engagement. Managing your LinkedIn® Company Page is a joint effort between a variety of internal stakeholders. From marketing and content teams managing the content calendar to social media and community managers engaging with comments left on their Company Page posts, everyone is involved in optimizing your business’ impact. That’s why Sprout’s collaboration tools work to facilitate communication across your team to enhance your brand’s social communication. When a LinkedIn user leaves a comment on a Page post, use tasks to alert a colleague who may be more equipped to reply. Personalize responses to a LinkedIn user engaging with your posts by accessing past comment history in the LinkedIn® Contact View. Create and apply tags to incoming comments to organize and track messages pertaining to campaigns, events or marketing efforts. Across departments, your company’s goals and objectives on LinkedIn® will vary. With Sprout’s LinkedIn® management tools, internal teams can work together to organize and share content, engage with the Company Page network and measure collective efforts with powerful Linkedin® analytics—all in one place. Comment below with any questions and stay tuned for more updates coming soon.